Today’s a day of firsts. It’s the first race the Monster Energy NASCAR Cup Series season. It’s the first time we see a race under the new pit crew rules. The first time we see a lack of a ride height rule at Daytona. I could list 4-5 more firsts but I’ll stop because we’re going green. Dale Earnhardt Jr, Matt Kenseth and Danica Patrick were all qualified for this event. However, they are all absent from the field. Starting positions were drawn by the crew chiefs. Austin Dillon and Denny Hamlin will lead the field to the green flag. It’s a short one, just 75 laps. There will be a competition caution at lap 25. Green, sparks fly in turn 1. 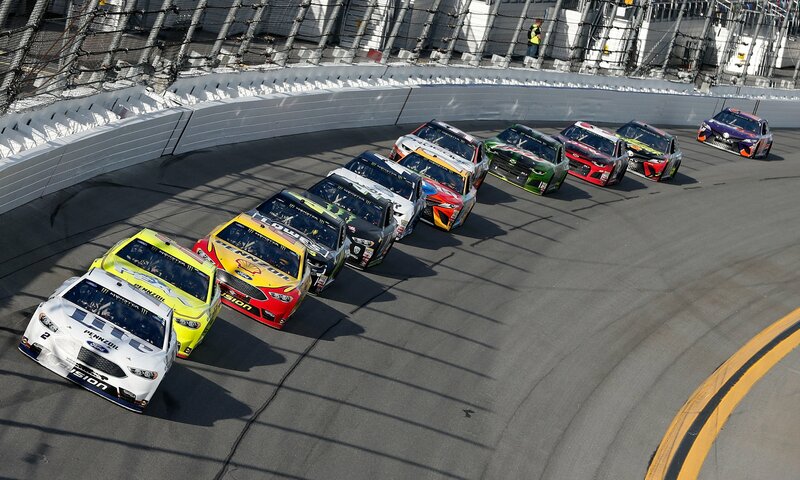 Austin Dillon leads the inside row, Hamlin leads the outside. Austin Dillon leads the first lap of the season. Lap 5, Denny Hamlin has migrated the field to the high side of the race track. 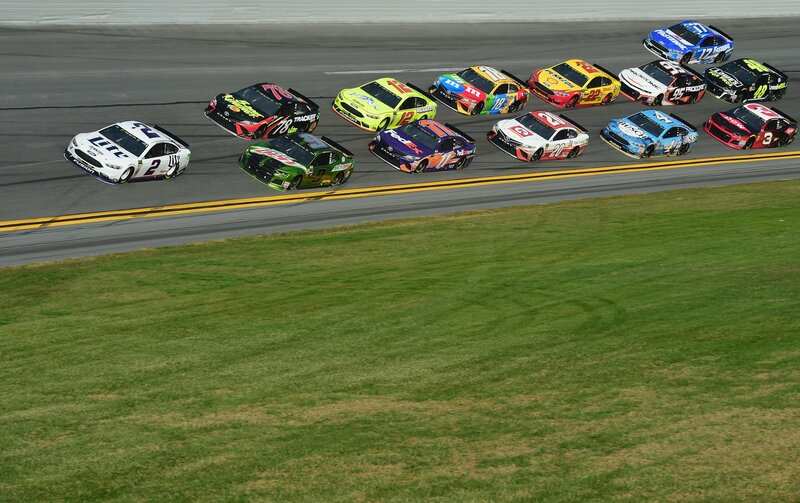 Hamlin, Jones and Truex lead the pack. Nearly the whole field is single file up against the wall. Kasey Kahne has nearly lost the draft. Lap 7, Kyle Larson had a run on Ricky Stenhouse Jr. He pulls out of line into turn 1. They make slight contact! Larson flies to the apron on corner entry. Sparks fly and Larson is sideways up the hill. He saves it and only lost a position or two. That was exciting! Lap 10, Chase Elliott leads a pack of cars on the inside. They are creeping up to the leader of the high line. Elliott is clear of Hamlin. He slides across his nose and takes over as the lead car of the high line. These cars are fighting handling issues. I’m seeing more drivers chase these cars into the corner more than I ever have. Jimmie Johnson is all over the track when he’s in the middle. This is great racing! Lap 17, Austin Dillon leads by Chase Elliott wants to lead back. Dillon attempts a block. Elliott dives to the bottom. Elliott back to the lead. Lap 23, Joey Logano and Chase Elliott bang fenders heading into the tri-oval. 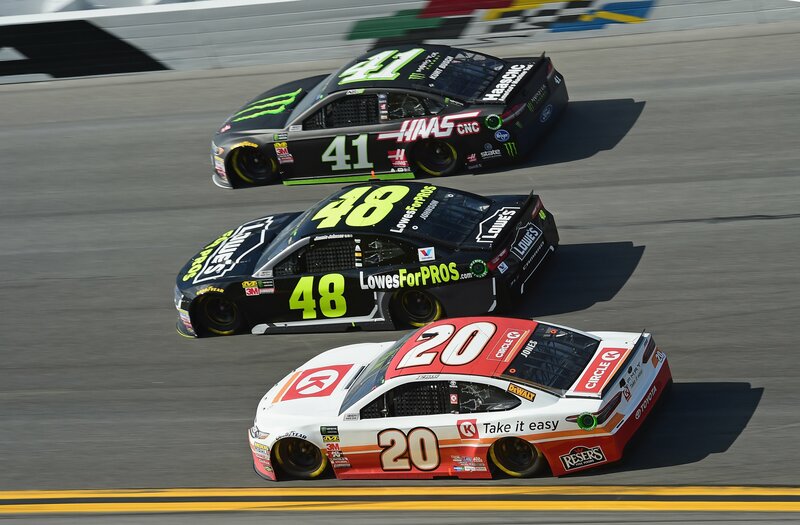 Elliott lifts, logano leads. Lap 24, most of the field hits pit lane. Kyle Larson remains on the track. 2 tires for most. Lap 25, the competition caution is out. Green, Keselowski leads with his teammate Ryan Blaney in toe. Martin Truex Jr tried to run the middle. Hamlin and Dillon closed that hole at the last second. “It’s hard to switch lanes in the corner. Going down it’s ok. 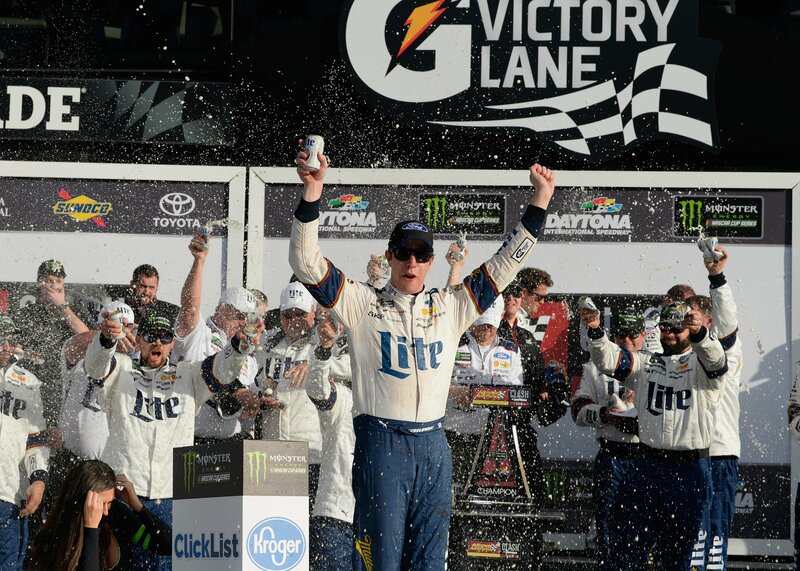 But, going up it’s a little difficult,” Brad Keselowski radio. Green with 37 to go. Brad Keselowski leads into turn 1 on the outside. He turns down to the apron, clear of Chase Elliott. He goes back the top, just ahead of Martin Truex Jr.
19 to go, Ricky Stenhouse Jr has just gone a lap down. He was forced to a drive through penalty after passing below the yellow line. He and Kyle Busch were battling for position laps before down the back straight when the violation occurred. 9 to go, Brad Keselowski has picked up a huge bag on the nose of his car. with 9 to go, that’s an advantage. He taped it up without a pit stop. But, at the same time, that’s a huge bag. 5 to go, nobody has budged. The field remains single file. 3 to go, Ryan Blaney has backed off the bumper of Keselowski. Joey Logano gives him a push but Blaney didn’t pull the trigger. Call that a test run. 2 to go, it’s a repeat of the lap before. Blaney looked to the inside in turn 3, he backs out and falls back in line. 1 to go, Blaney pulls out of line, Logano doesn’t go with him. Johnson gets turned down the back! 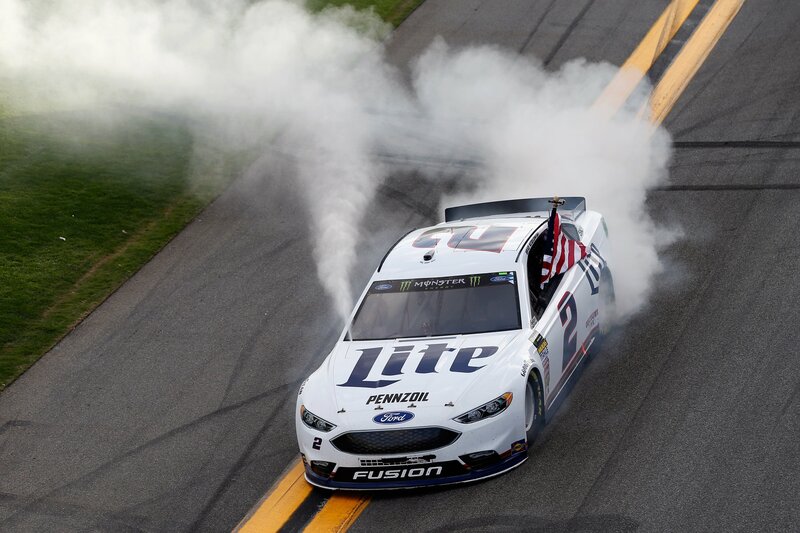 Brad Keselowski wins The Clash at Daytona! View full 2018 Clash at Daytona results below.